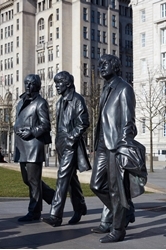 A Beatles Tour in England? You Know That Can't be Bad . Beatles Radio: The Beatles, Solos, Covers, Birthdays, News The Fab 4 and More! When I suggested to my Beatles-obsessed husband that we should go to Liverpool, I won points for the rest of our marriage. What I didn’t realize until later, when I was standing on a certain lane behind the shelter in the middle of the roundabout, was that I would actually enjoy myself. Very strange. I had wondered if, in making such a pilgrimage, there would be a place for the nonreligious. But when slanted sunbeams fell on Eleanor Rigby’s headstone as if on cue, I shivered a little and smiled.